There is a huge viral effort that has embarked to save the canceled television series Dallas. Thousands of fans, the cast and crew members of TNT’s “Dallas” are calling on the cable network to renew the show and keep it on the air. TNT announced shortly after the season three finale that it would not renew the well-reviewed series for a fourth season. Countless viewers who have been loyal fans launched A “Save ‘Dallas’” petition on the website Causes.org, which to date has attracted more than 83, 050 signatures. The campaign’s creator, Sara Duckworth, saying that the legacy of the famed fictional Ewing family is too important to simply discard. 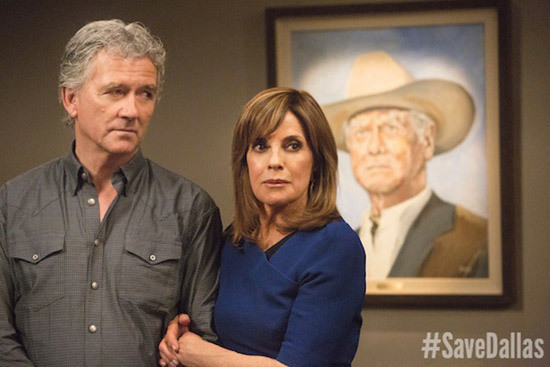 As news of the cancellation spread #SaveDallas began to trend on Twitter with now over 700,000 tweets. A new effort of barbecue sauce jars are being shipped to other network heads to possibly open doors and find a new home for Dallas! Patrick Duffy took to the airwaves this past week speaking out on radio shows across the country asking the fans to not give up just yet. That they can make a difference and canceled shows in the past have been revived due to the outcry of fans. Cynthia Cidre the brilliant writer and Executive Producer of the new Dallas re-boot wants the show to continue believing the Dallas team of writers, directors, cinematographers and the actors want this legacy to continue. Bobby, Sue Ellen, and all the characters are not done yet! Dallas has been part of television history and the re-boot was many believe one of the best television series on the airwaves and feel it needs to find a home! You can help by signing the petition, tweeting #savedallas or send a letter to TNT or other networks asking to pick up this show! Let’s all make a difference to the network policies and demand our Dallas! Sommer Ray Hosts FENTY PUMA Line in Beverly Hills!